The girls suit up to make a scene at the Stone Water-sponsored Young Voices Awards, where McKeyla and Kyle finally talk face to face. While the girls dig for more information on Bobby Stone, Adrienne and Ember make a surprising discovery about Stone Water -- and where it comes from. A familiar face from McKeyla's past steps up to help as her family connections to the case grow clearer. And "Bry-ence"? Well, it's bigger than ever. 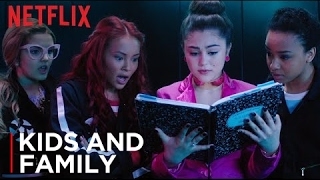 Currently you are able to watch "Project Mc²" streaming on Netflix.